I have roughly 5 weeks until baby #4 comes…and it feels like I have so much time and barely any time left all at once. I’ve slowed down quite a bit, and I’m trying to give Sophie some quality Mom time before baby comes and rocks her world. Oh and my ankles and feet are swollen past recognition…if I showed you a picture you’d have to flush your computer down the toilet and eat a pint of ice cream to recuperate. Oh the joys of the last trimester! I may have slowed down a bit but my trigger finger (a.k.a. online fabric purchasing clicker) has definitely not! 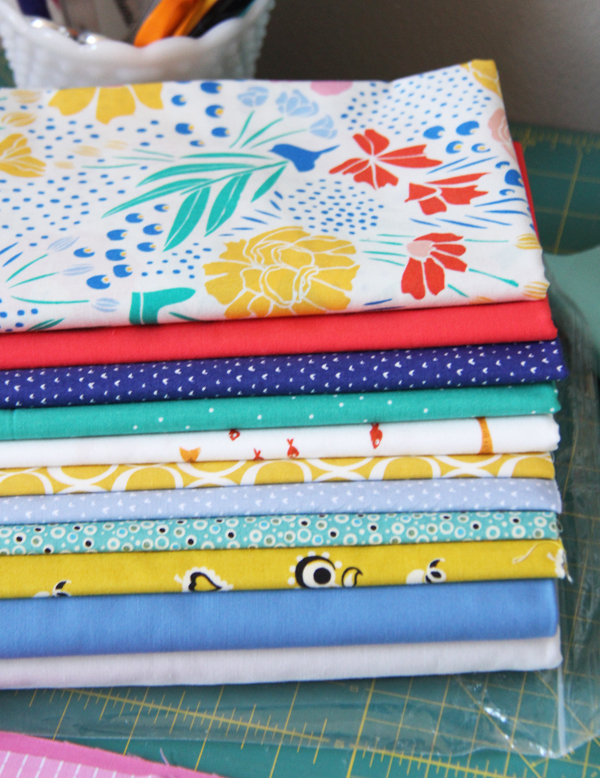 I have been waiting for a few months for that top print by Leah Duncan for Cloud 9 fabrics (purchased here). It’s a bit tricky to find but the most beautiful print…and it so perfectly coordinates with a lot of the prints and colors in my stash already. Eeek I love it so much. I received the most beautiful gift in the mail a few weeks ago from my friend Keera in Australia. Each one of those tiny spools is wrapped in a strip of my fabric! Talk about a labor of love! I love that this online space has gifted me with wonderful, supportive, and loving friends. She has a tutorial for making these wreaths here. 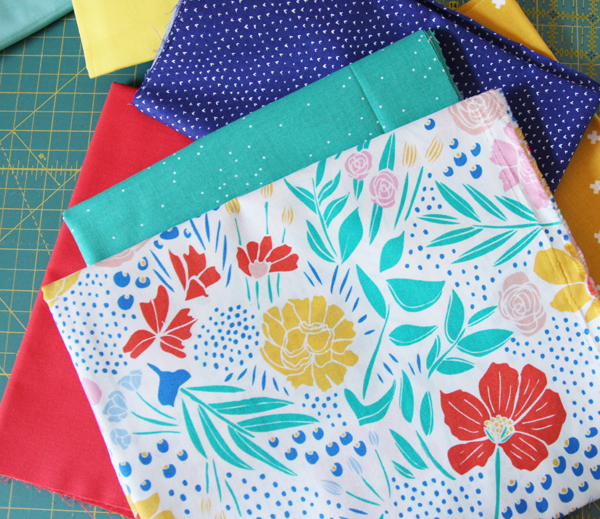 She also makes beautiful patterns and has a beautiful blog! Best of luck to you as you wait for baby’s arrival – love that wreath! husband!!! I love to read your blog, so Take care of yourself these last few weeks, enjoy the slower time! 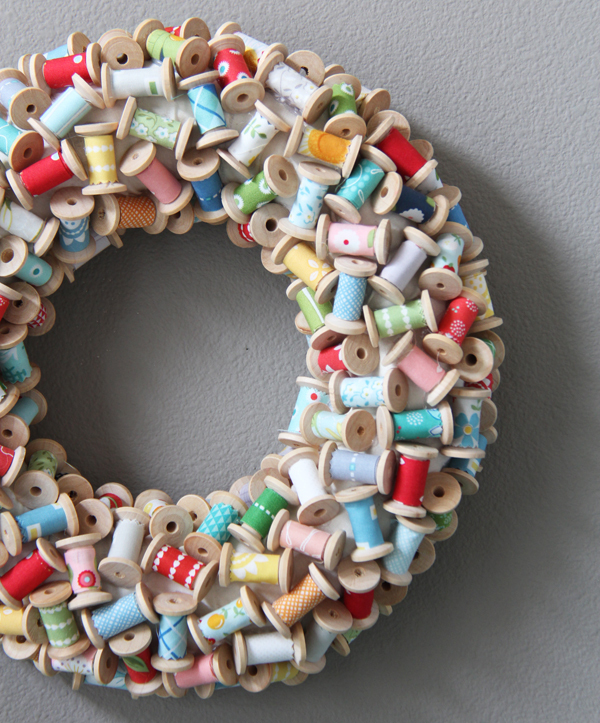 This wreath is almost as adorable as your sweet Sophie. Keera’s gift for you is amazing Allison! How wonderful to see your fabrics displayed like that! I did not realize how far along you were… oh your poor swollen ankles and feet. You made me laugh though with the flushing and ice cream eating description. Take care and keep your feet up as much as you can! Sophie is adorable and I bet she will enjoy being a big sister! It’s going to be wonderful to have a new baby, and May is so pretty! Love your gift! That print fabric is really pretty. I do like Cloud 9 fabrics. Take it easy through the summer and enjoy the new little one. They grow very fast! I hear you on the ankle business. When I was pregnant with my twins, it started in my 5th month. Fllip flops all day, every day! Take care and all the best for the arrival of wee #4. Best wishes to you and the new little one that’s arriving soon. I love reading your blog and your family is so precious. Enjoy, they grow fast. Sophie is adorable. She will make a great big sister. Yes, that is a gorgeous fabric, and that wreath! What a special gift. Love the fabric and wreath too – you have a great eye to combine fabrics. How wonderful to have an addition to your family – babies are the best gift! Hope you are staying off your feet and relaxing! You’ll be busy for sure, but please don’t forget us and nice that you have older kids that may help… may is the big word since the older ones are boys, but I bet cute Sophie will just love a new baby to hold and help with! As always, thanks so much for sharing! We must have almost the same due date (mine is May 20th), but I am only on number two! Best of luck, and thanks for all the quilting inspiration! I was waiting to see what you’d do with the new Leah Duncan prints! Every time I saw that I thought of your color scheme based on that Elizabeth Olwen floral print. So exciting, baby #4! I hope your birth is great! What a fun wreath! And I love that flora! So pretty! What a FUN and wonderful gift! Lucky you! Hi there. I noticed your cute firstborn on her fun bike. My daughters learned late bike riding since we lived in San Francisco. Then we moved the burbs and they picked it up quick. They used to have training wheels but we found taking them off was best along with the pedals. 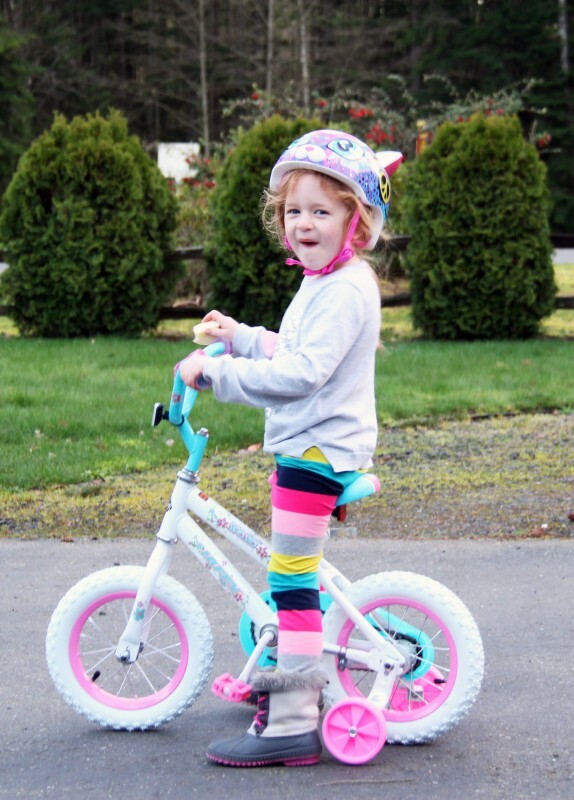 You daughter can use her bike as a balance bike where she sits and pushes off with her feet that can step down to stop. My 8 year old last year practiced a bit every day gaining her sense of balance and by July 4th, she was ready to pedal. Good luck to you on adding another blessing to your ohana. Juggling two is a lot different than one but a wonderful experience.